When you’re looking to copy files directly from the Internet cache, to a place of your choosing, CacheSort is the way to go. It’s basically a copier of cache, which is useful when you’re looking to dump the things you’re surfing or what not into categories. Works with Internet Explorer, Firefox, and Opera. And it’s freeware for Windows. 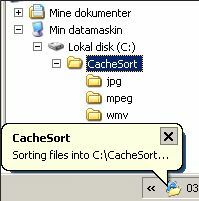 So the next time you’re looking to just get some stuff copied over, but you don’t want to go through the trouble of saving each and every website, just do a dump of your cache with CacheSort. It’s easy, fast, and super customizable.